Are you a professional? If yes, do you know who a professional is? What are the characteristics of professions? If you are a professional or live in a professional society or involve in a professional organization, you must have some ethics or ethical principles. Do you know what they are? Have you ever marked what the stages of development of a professional are? Have you prepared an action plan to achieve professionalism? Dear ELT professionals, where do you fall in the professions grading if a survey is carried out in our society, the country and the world? I was not familiar with the answer of the questions stated above and so are many of us although we have been talking about professionals and professionalism time and again. I have recently attended the talk by Respected Associate Professor Ganga Ram Gautam, (the Immediate Past President of NELTA) on “Professionalism and a Professional Organization” that opens the door of the answers of the above questions, which have left a clear imprint on me and guided me to walk on the way of professionalism. Respected Ganga Sir had a talk on the theme on September 10, 2011 at NELTA office, Kamaladi, Kathmandu, which brought together 25 NELTA members from NELTA central and branches. I would like to share in this brief post a few thoughts and reflection on his talk ‘professionalism and a professional organization’. – The occupation which one professes to be skilled in and to follow. – A vocation in which a professed knowledge of some department of learning or science is used in its application to the affairs of others. Applied specifically to the three learned professions of divinity, law and medicine. – Any calling or occupation by which a person habitually earns his living (now usually applied to an occupation considered to be socially superior to a trade or handicraft). He further talked about the history of professions. By medieval times, (500 CE-1500 CE.) all the classic professions (medicine, law, education and clergy) began to come near the modern conception of professions. Around the end of the 19th century and the beginning of the 20th century, middle-class occupations such as dentistry, architecture and engineering began to professionalize, seeking to achieve the gentlemanly status of the classic, learned professions. The talk moved on with the presentation on perception and characteristics of professions. He referred ‘The Encyclopedia of Sociology’ to say that Professions are groups which declare in a public way that their members will act in certain ways and that the group and society may discipline those who fail to do so. The profession presents itself to society as a social benefit and society accepts the profession, expecting it to serve some important social goals. On the perception of professions, he presented that George Bernard Shaw declared in the Doctor’s Dilemma, first staged in 1906: “All professions are conspiracies against the laity.” Similarly, Talcott Parsons defines that professionals are ideal citizens of an ideal state and are holding society together. He shared Magali Sarfatti Larson’s three dimensions of the ideal profession: cognitive, normative and evaluative dimension. To support the notions, N. Roscoe Pound, Former Dean of Harvard Law School opines that professionals find fulfillment, self worth and true happiness in contributing to their society and improving the human condition. Your first duty is to do good. Then he continued his talk with professional ethics. Ethics can be defined by a set up of moral principles or values. Each of us has such a set of values. We may or may not have considered them explicitly. TESOL-association of American educators claims that professional ethics express what a professional society is about. A code expresses who the professionals are, what they do, and show how this profession functions or the good of all. Christiphor J. Cowton, Dean of Business School, University of Huddersfield puts his views, profession can defer in degree to which they serve the public interest by being ethical. 1. Responsibility: Professionals should exercise sensitive and moral judgments in all their activities. 2. Public interest: Members should accept the obligation to act in a way that will serve and honour the public. 3. Integrity: Members should perform all responsibilities with integrity to maintain public confidence. 4. Objectivity and Independence: Members should be objective, independent and free of conflict of interest. 5. Due Care: Members should observe the profession’s standards and strive to improve competence. 6. Scope and Nature of Services: A member in public practice should observe the Code of Professional Conflict. The presentation and talk further included the Code of Ethics of the Leadership in a Professional Organization like NELTA. They are Commitment to its Members and Commitment to the Organizational Values and Missions. When the organization makes commitments to its members and the organizational values and missions, NELTA will, no doubt, have professional development. Now I am familiar with six characteristics of professional styles: altruistic, ethical, responsible, theoretical, committed and intellectual style. There are certain stages of development of a professional shared in the talk according to Meszaros and Braun (1980). – What have I learned that I can put to immediate use? – What do I want to do in the future to improve my professional style? – Carefully evaluate your own actions and how they relate to your internal beliefs and assumptions. – Challenge whether the belief or assumption is valid. – Create an action plan to work on bringing more coherence between actions and beliefs, creating greater integrity and authenticity. Finally he talked about professional grading, for which, rating of a survey carried out of 21 professions in America was presented, wherein nurses are found highly professional. Such surveys can be carried out in the context of Nepal as well and the participants explored its opportunities in the session. In conclusion, it can be said that ELT has not yet acquired professionalism. To support, Ur (2010) puts her views, “English language teaching has not yet reached the level of professionalism (p. 390). That is to say, English Language Teaching (ELT) is in the process of professional development in the world including Nepal. Besides, the talk proved an exposure to my M. ED. 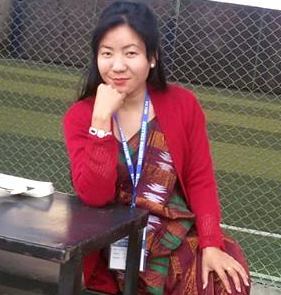 Research which I am currently carrying out on the topic ‘Professional Development in Nepalese ELT through blogs: A Case of NeltaChoutari’. Dear NELTA members- Let’s promote professionalism in us and in NELTA both. The more NELTA becomes professional organization, the more its members become professional.